Lots of new photos taken today with two hours spent over Thanet for Kent police. 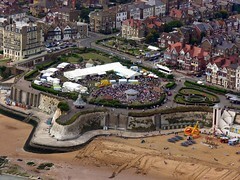 The complete library is at http://www.flickr.com/photos/drmoores/sets/246031/ but you can see that Broadstairs looks pretty busy from above. More great pics, thankyou! An amazing amount of building going on in Westgate. So sad to see the old cricket pavilion at St Augustine's has gone and the cricket square now occupied by ghastly mock georgian terrace with twee little gardens. The orchard there has gone the same way as the Ursuline College orchard has just gone. They have had to preserve the big lime tree but I wonder if the echoes of "Come on Alcock, Bergh or Egan" persist around the tarmac and neat closes at St Augustine's as the sun sets on June evening?